Daily Oklahoma Cash Grain Prices- as reported by the Oklahoma Dept. of Agriculture on Thursday, April 19th. Come See us at the 2018 Oklahoma City Farm Show- Today 9 to 5- Saturday from 9 to 4! -- Make Tracks to the 2018 Oklahoma City Farm Show- Today and Saturday! After days of setbacks, progress is finally starting to be seen in regards to the Rhea Fire Complex that has burned over 280,000 acres in Dewey County, forcing multiple communities to evacuate. Yesterday, the Oklahoma Forestry Services reported a moderate increase in the fire's containment, up from a stagnant three percent to 15 percent. 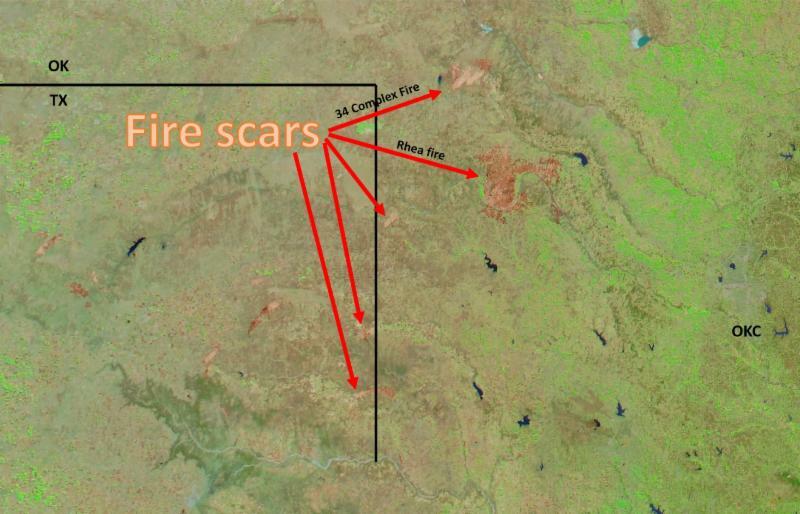 The image above is a satellite photograph in which you can see the burn scars quite clearly up and down western Oklahoma. The image offers an interesting perspective with the size of the Rhea fire. The Florida Forest Service Red Team is managing the Rhea Fire, working under the authority of OFS in unified command with the local fire departments affected by these incidents. The northeast side of the fire-southeast of Seiling and east of US Hwy 270 remains the most active area of the fire. Strong winds and cedar trees have contributed most to the fire's growth by sending wind-borne embers far ahead of the main fire, igniting unburned vegetation. Suppression efforts are underpinned with a fireline strategy currently, to buffer unburned vegetation from the main fire. Overnight teams are concentrating on mopping up the less active areas of the fire and reinforcing the security of firelines. For more information, check out the latest report from OFS on the status of the Rhea Fire by clicking here. 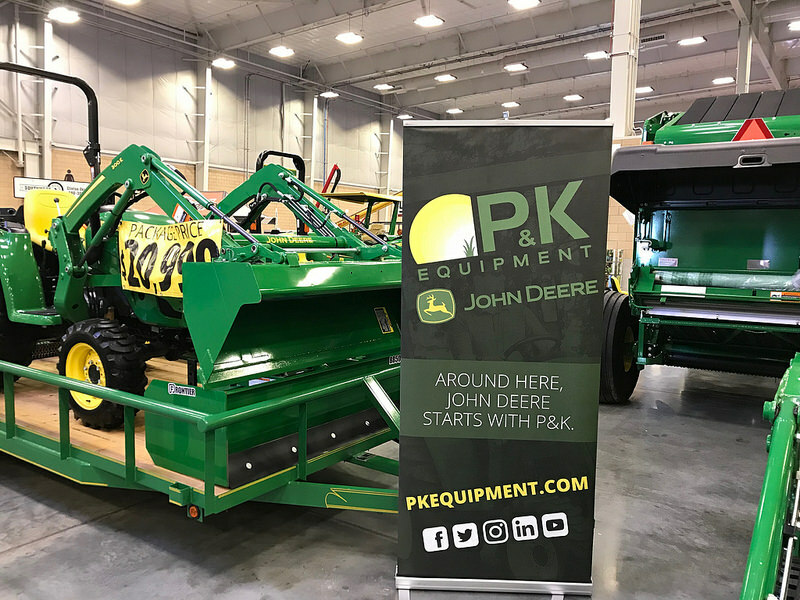 AND- we invite you to stop by and check out all the equipment that P&K has at the 2018 Oklahoma City Farm Show- today and tomorrow!!! 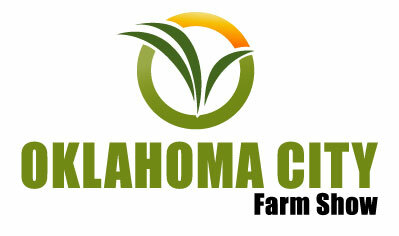 According to State Executive Director Scott Biggs, the Oklahoma FSA is working with other agencies and the private sector to organize a meeting scheduled for next Tuesday, April 24 at 1:00 p.m. at the High Plains Technology Center in Woodward to help affected producers understand the tools available in the aftermath of recent wildfires to aid in the recovery process. 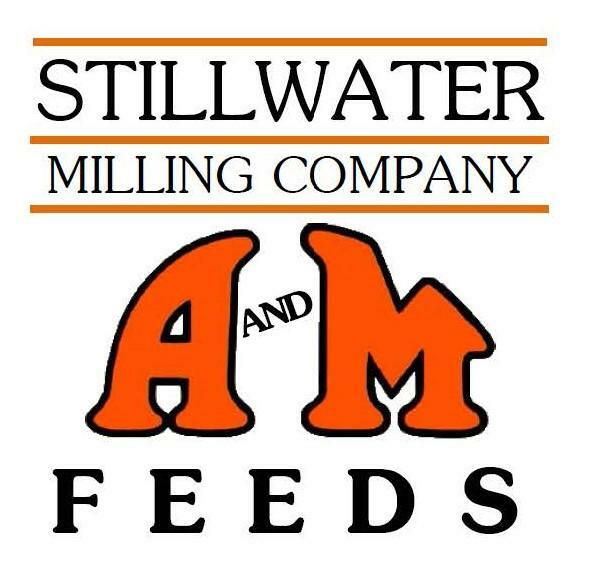 The Oklahoma Cattlemen's Association will be providing a noon meal for those producers who are able to attend. Both Biggs and Bowdy Peach, Woodward FSA executive director, will open the meeting and provide a general overview of pertinent information. One key program producers should strongly consider if they have suffered the loss of livestock, is the USDA's Livestock Indemnity Program. Eligible producers could stand to receive quick payments if they qualify. Oklahoma State Extension has authored an article affected producers might find useful on the LIP program. Click here to read that article. We also have posted earlier an excellent overview of the various FSA programs that can help ranchers and farmers to push back on these terrible fires that continue to burn- click or tap here for that information. To listen to my conversation with Scott Biggs- click here. 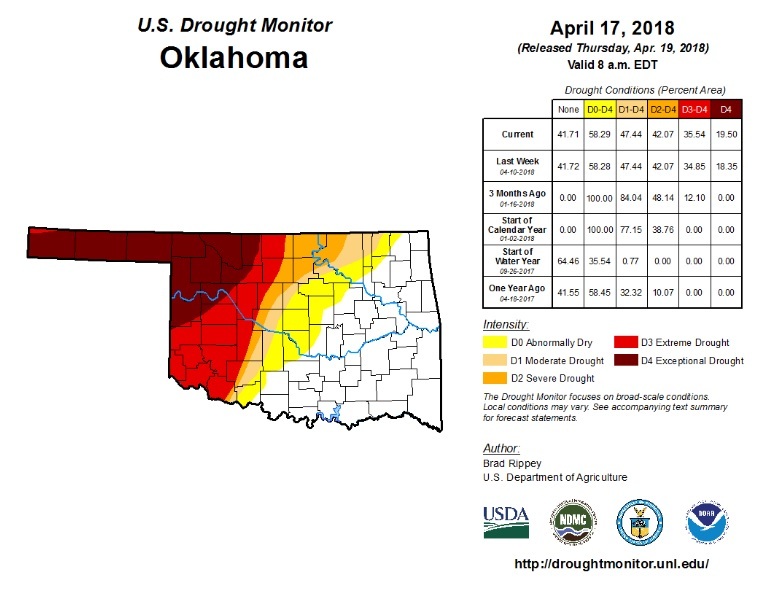 No significant change has been made to this week's Drought Monitor ratings since last other than perhaps a one percent increase in the exceptional drought category which now engulfs the entire Panhandle region. Exceptional Drought is now spread across 19 percent of the state, 35 percent in extreme drought, 42 in severe drought, 47 in moderate drought and 58 percent of the state under abnormally dry conditions. More favorable weather conditions have appeared in forecasts at last, giving hope that the western half of the state might actually receive some moisture this weekend. However, according to State Climatologist Gary McManus, the slow-moving storm system approaching will likely deliver some "decent" moisture to the west but will unlikely be the drought-busting storm everyone is hoping for. House Agriculture Chairman Mike Conaway is hopeful the U.S. House will consider the 2018 farm bill next month. Conaway told reporters he wants to bring the bill to the full U.S. House in May, but says the must-pass National Defense Authorization Act will be taking up time on the floor in coming weeks. The bill faces a partisan divide as no Democrats on the House Agriculture Committee voted in favor of the legislation earlier this week. House Minority Leader Nancy Pelosi says the bill does not include enough support for agricultural producers, and that the nutrition title proposals would waste tax payer money and increase hunger and poverty. In the Senate, Ranking Agriculture Committee Democrat Debbie Stabenow says the House version of the bill is "impossible to pass." She alleges that House Agriculture Committee leadership has "abandoned" the broad, bi partisan coalition that passed the 2014 Farm Bill. Stabenow says she "remains committed" to working Senate Agriculture Chairman Pat Roberts to "write a bipartisan bill" that focuses on "farmers, families, and rural communities." Admission and Parking are free- show hours today- Friday- are 9 AM to 5 PM- and on Saturday- Show Hours are 9 AM to 4 PM. Exhibits include all of the latest in agriculture with a full line of displays, including tractor, sprayer, tillage, harvest equipment, cattle management products, and more. Over 350 exhibitors are ready to talk with you about their services and producers for your farm and ranch- both on the work side of things as well as many items that will make your home a more enjoyable place to live! 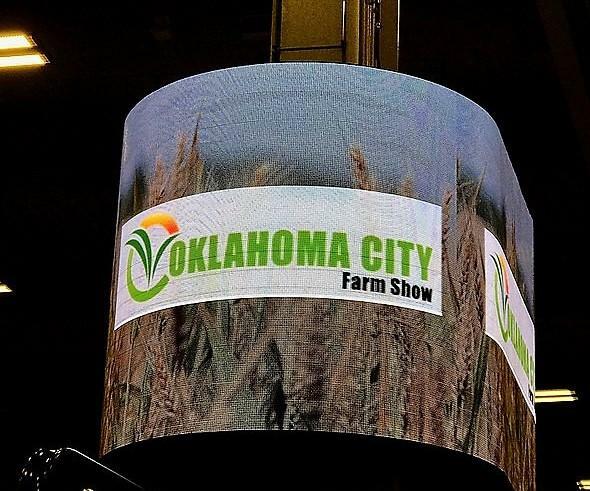 Click here for more details about the 2018 Oklahoma City Farm Show- presented by Midwest Farm Shows. Our own Carson Horn sat down recently with Mike Mayberry, whom oversees the Oklahoma Agriculture Mediation Program. 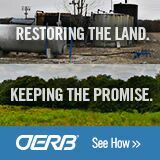 With the many environmental pressures that ag producers have been faced with this year in Oklahoma - drought, late freezes and wildfires - Mayberry says there may be numerous people in rural communities that might find his services useful as they sort through unexpected financial stress. "We help Oklahoma-based producers with disagreements or difficult situations they may be having with a lender, a creditor, one of the USDA agencies or even their banker," Mayberry explained. "We bring them in a room together where they can talk it out so to speak." At no cost to the farmer or rancher, Mayberry says the Oklahoma Agriculture Mediation Program strives to get people at the table to work together before the stress becomes intolerable. Often, he says the mediator can find solutions that no one has thought about. These consultations are always held in the strictest confidence. With a remarkable 90 percent rate of success, Mayberry invites anyone dealing with applicable hardships to contact his office to set up a meeting. For more details or to hear their conversation, click here. 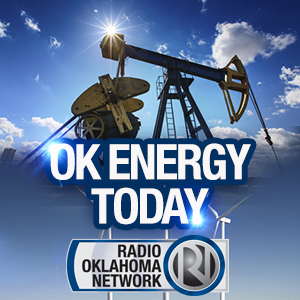 Kim Anderson delivers some good news and bad news for Oklahoma's wheat industry this weekend on SUNUP. Drought and freezing temperatures for instance, certainly fall into the bad news category, he says. These have obviously contributed to this crop's poor development - which has so far resulted in the worst level of crop conditions Oklahoma has seen in years. In addition, Anderson says the Kansas City July contract recently fell about 40 cents, dragging the harvest price of wheat down with it. Topping things off, he says China has added even more uncertainty into an already depressed market, slapping increased tariffs this week on US grain sorghum as part of an ongoing trade dispute. Despite the harsh elements farmers have had to deal with, he says the good news is that there are still areas in the state where wheat has not been damaged by late freezes and have also managed to survive persistent drought conditions. More so, rain is expected in the forecast which might help to promote better yields, test weight and protein levels in viable fields. Also, while the Kansas City July contract has dropped lower, Anderson says the basis has actually risen up about 45 cents over the last month and a half - a sign that the market needs this crop, he says. All things considered - Anderson says he says he is feeling rather optimistic right now and suggests $5.00 wheat is still within reach if farmers can deliver a high quality product. You can watch their visit tomorrow or Sunday on SUNUP- or you can hear Kim's comments right now and see what else is on the lineup for this week's episode, by clicking here. Yesterday, we introduced your 2018 Northwest Area Star in Agribusiness, Logan Maher of the Mooreland FFA Chapter in our continuing coverage of this year's area Stars. Since 2014, Maher has operated a successful lawncare business, which has taught him the importance of maintaining a high-level of customer service and satisfaction, keeping accurate financial and service records among other skills. Maher says FFA has helped him grow into leader, instilling in him the strong work ethic and sense of responsibility every small business owner needs to be successful. After graduation, Maher plans to attend Oklahoma State University to pursue a double-major in Ag-Economic and Accounting. He hopes to expand his business to the Stillwater are where he can continue to build his customer base and maintain his enterprise. You can hear our entire conversation by clicking over to the Blue-Green Gazette on our website. As we salute the 2018 Area Stars of the Oklahoma FFA, we extend our special thanks to the sponsors of our coverage, American Farmers & Ranchers and AFR Insurance. Two great sales happening this week, if you are in the market for some top quality cattle. Today's sale features 46,00 head of yearling steers and heifers, weaned calves, calves on cows and bred stock. 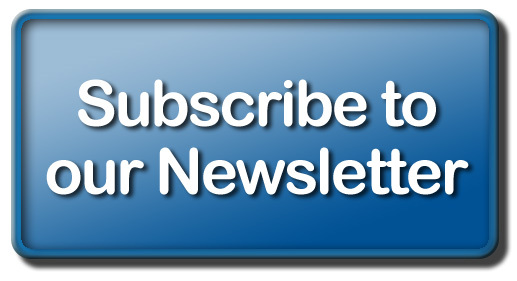 Click over to our calendar page for more details. By the way- Robert York with National Livestock- parent of Superior- tells us they will be encouraging folks to give to the Oklahoma Cattlemen's Foundation Wildfire Relief Fund this morning- and will be announcing a gift from the company to the fund this morning as well. Then on Saturday - it's the Express Ranches Grass Time Sale, noon at the Ranch in Yukon, Okla.
Express Ranches will also be donating the entire proceeds from lot 1 in the 2018 Grass Time sale to the OCA Foundation Fire Relief Fund to help fellow producers in NW Oklahoma recover from the losses of recent wildfire damage. Yesterday afternoon, Mark Squires emailed us saying "it has been a tragic week for many of our fellow Cattlemen from western Oklahoma and our hearts and prayers are with them." Tip of the Hat to Bob Funk and Jarold Callahan! Click here for more information on Saturday's sale.